Brenda Gayle Plummer. Haiti and the Great Powers, 1902-1915. Louisiana State University Press, 1988. 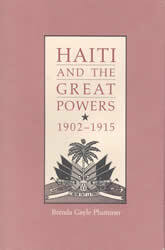 Haiti and the Great Powers, 1902-1915 examines a critical period of Haitian history and diplomacy. In this widely researched and persuasively argued study, Brenda Gayle Plummer contends that the social, economic, and political decline of Haiti during the early part of the century was hastened by many factors: the growing commercial and military competition in the Caribbean among the great powers; the less favorable terms of trade; the development among the cosmopolitan urban elite of a culture of imitation and alienation from Haitian national values; and the inability of traditional political mechanisms to provide satisfactory solutions to new problems. The significance of Plummer’s study is threefold. First, there are few reputable and current English-language texts on Haiti. Lurid, sensational, and racist books have been written, but the North American reading public has not been encouraged to take Haitian subjects seriously. Second, Plummer’s work, breaking out of the tradition of considering Haiti as a case apart, attempts to place the nation in the context of a broader Caribbean history. Plummer views Haiti’s experience as the first “Third World” republic as both admonitory and heuristic. Finally Haiti and the Great Powers synthesizes much of the growing mass of data about the period and offers fresh interpretations. Plummer is concerned not only with statecraft but with a host of factors that are pertinent to a holistic consideration of societal change. Her research thus includes governmental archives, personal manuscript collections, the contemporary periodical press, Haitian language and polemics, interviews, and biographies. Plummer examines a rich, complex society without the reductionism inherent in a treatment of diplomatic, political, or social history. The result of Plummer’s extensive research is a highly original, provocative, and engaging study.